ABC Fire Equipment is a family owned and operated fire equipment company. We have operated our company on the idea that our customer service has to be the best, and have done so for over 30 years. ABC Fire Equipment Corp. is committed to being the most reliable and dependable fire equipment service company in Southwest Florida. We provide quality products and services which will conform to the needs of our customers, large and small, while maintaining a competitive edge with our pricing. At the age off 22, he dedicated his life to fire safety and became a fireman. Shortly after, he partnered up with the Assistant Fire Chief and opened his first fire equipment company. He relocated his family to Naples in 1982, bought Naples Fire Equipment, which has since evolved into ABC Fire Equipment. With his continued guidance and support, the family business continues to grow strong. Is a graduate of The University of Florida with a degree in Business Management. At age 11, he was working in the shop and continued working summers throughout high school and college. After graduation, he became a service technician and systems installer for several years to gain the experience necessary to learn this industry. He has learned the in’s and out’s of running a successful business and is hands on. Attention to detail is a strong trait, and one that both the customer and fire marshal appreciates. Is a graduate of The University of South Florida. While considering her career options, she started working in the office after graduation on a temporary, part-time basis…and never left. Coming to know and love the industry, making customer service a priority, has made our customers secure in knowing they are always number one. Giving confidence to our customers when a service call is placed or following up on the required annual/semi-annual service – and knowing that customer service starts with the office. Recruited to help run the growing business after 10 years in sports injury medical field. Is a graduate of ITT Technical Institute and has an eye for mechanical operations as well as customer service. Supervising the field technicians – and knowing that customer service continues with the technician’s service. From beginning to end, we strive for customer satisfaction. "Keeping it Local"…Most of our service technicians live in your service area, to better assist you and to help "keep it local". 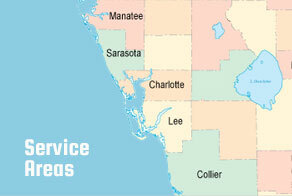 All of our technicians are highly trained and State Certified. We have a fleet of trucks and vans ready to meet any and all of your fire protection needs 24 hours a day.